Take 94 W toward Eau Claire / St. Paul. 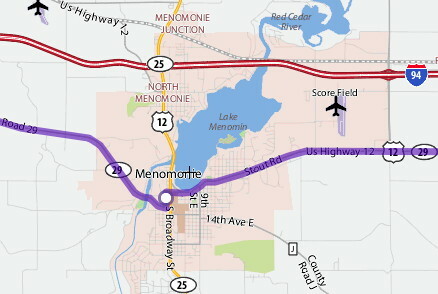 Take exit #52 (Colfax / Elk Mount / Menomonie) onto US-12 / Hwy 29 West. Turn right onto Hwy 29. Continue to follow Hwy 29 West. It will turn at Broadway Street and 11th Ave.
After crossing the bridge over the Red Cedar River (leaving Menomonie) travel West approximately 6 1/2 miles. StrandVision Digital Signage is 7 driveways on the right after Kyote's Den Bar and Grill. Turn right onto 203rd St for 0.5 mile. It is a dead end road. There is a brown octagonal shaped house on the right just before the turn. Once the hill has been crested, you will see the office at the end of the street on the right. Take 94 E to Eau Claire. 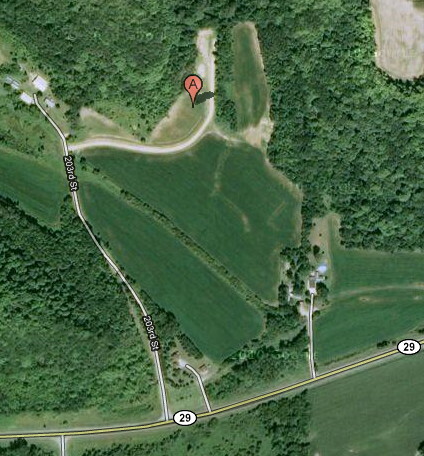 Take CR-Q, exit #32 / Knapp. Turn right onto CR-Q for 3.4 miles. Turn left onto 203rd St for 0.5 mile. It is a dead end road.